Are You Looking For a Fayetteville Air Conditioning Company Today? 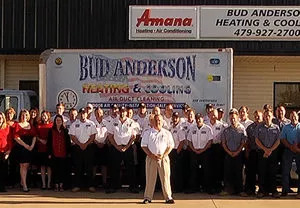 Whether you need HVAC repair, installation, or service in Fayetteville, you can count on Bud Anderson Home Services. Call today for service! We specialize in residential and commercial air conditioning repairsin Fayetteville, and our team of highly trained technicians isconstantly staying up-to-date on the latest codes, practices, equipment,and proper techniques for repairing air conditioning systems. You can rest assured when you call us for air conditioning repairsin Fayetteville, you will receive expert service and quality results! Bud Anderson Home Services carries a wide range of Daikin air conditioners and cooling systems for your air conditioning installation and replacement needsin Fayetteville. If you need a reliable AC unit or a newer, more energy efficient central air conditioning system, you can rely on us to find the product that’s right for your needs and budget. Our air conditioning installation crew works diligently to ensure all areas are kept clean and that your new AC unit is operating properly. Bud Anderson Home Services can also take care of any heating repairs for your Fayetteville home or business. As soon as you notice that the general temperature of your home or business is dropping, there is a chance that your furnace or other heating system has stopped working. Fayetteville furnace repairs should always be handled by a professional. Call your heating repair specialists at Bud Anderson Home Services for any Fayetteville furnace repairs you may need. When you need to replace an old heating unit because it either doesn’t work anymore or is costing you too much in energy bills, make sure you contact a reliable Fayetteville heating installation specialist to do the work for you. Installing a new heating system requires skill and specialized tools to ensure everything is working properly to heat your home.Bud Anderson Home Services offers top-quality Daikin furnaces, heat pumps, and ductless heating systems for all your heating needs. Want to improve the quality of your home’s indoor air? If you’ve never signed up for our Fayetteville duct cleaning services, this is the first step you should take! Our professional Fayetteville duct cleaning specialists will ensure your heatingand air conditioning ducts and vents are clean and clear of dust and other particles that contribute to the air pollution in your home. Our Fayetteville duct cleaning service should also be employed should your home ever suffer from mold growth, and the ductwork of your HVAC system is notorious for being a breeding ground for molds. Why Choose Bud Anderson Home Services for HVAC Service in Fayetteville? At Bud Anderson Home Services, we make sure to “roll out the red carpet” for our customers.Our Fayetteville heating and air conditioning technicians show you and your property complete respect by using shoe covers and floor protectors to ensure a clean work site while they perform the HVAC services you requested. Our Fayetteville air conditioningand heating professionals always clean up after the job is completed, ensuring your property is as clean or cleaner than when we arrived. If you are looking for a Fayetteville air conditioning or heating professional please call ​(479) 927-2700(479) 927-2700 or complete our online request form.